Although cats make great pets, there are many times when wild populations or cats left to run loose can present problems. This article will address some of these problems and offer solutions. 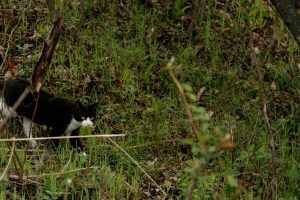 Nuisance cats can cause damage to plants and wild life. 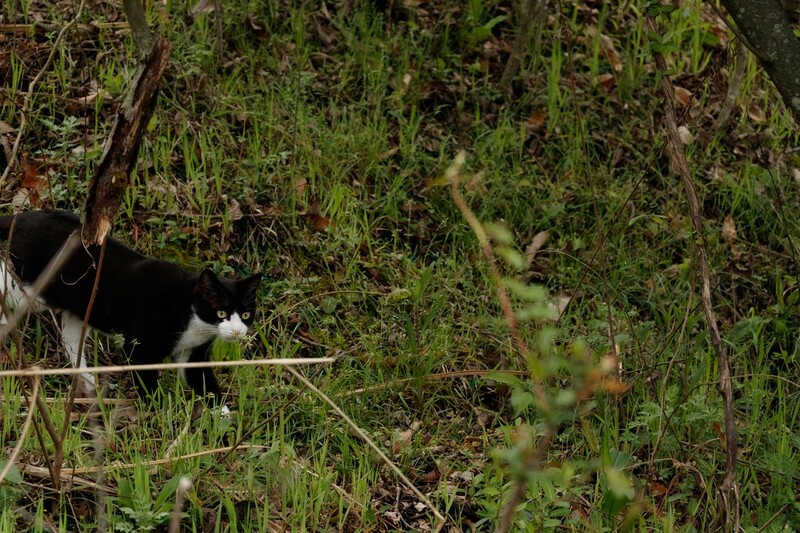 A cat has many predatory instincts which are lived out when they are able to forage freely beyond the confines of their home. Many times they will prey upon innocent birds and wildlife which are easy targets around bird feeders. Cats like to leave scent markings to let other cats know their territory. This smell is both offensive and lingering. Many times it will lead to more cats coming around. This is the most common problem found in urban America now; feral cats living in the wild but coming to one location to meet, mate and make a mess. Cats rely heavily on scent and the first way to get rid of lingering cats in the yard is to diffuse their odor. Once cats start defecating in the yard, the smell will attract more cats which means more urine, more feces and more spraying to the surrounding trees, landscaping and structures. To stop cats from finding your home, you need to get rid of this smell. Most animals use scent to identify good trails to use and where all the “action” is in the neighborhood. Often times these smells are hard to detect. Cat odors are very strong and can’t be missed. And they carry for great distances attracting cats from miles away. The most important step at getting rid of cats in the yard is to get rid of these attractors. NNZ is a biodegradeable fast working agent which neutralizes odor immediately. It can be sprayed over grass, pine straw, flower beds, trees, shrubs and strucutres with no risk to the plants. Mix 8 oz per gallon of water and plan on getting 500 sq/ft of coverage per mixed gallon. In general, you want to target all pathways, routes of entry to your property and the ground they are using for a litter box. They will commonly climb over fences so spray them too. One jug will make up 8 gallons which is enough to treat up to 4,000 sq/ft. 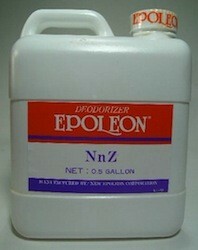 Use any good PUMP SPRAYER to apply the NNz and in general, one good treatment will get rid of the smell within one day. Once the odor has been removed from the yard, install ULTRA SOUND REPELLERS along property entry points to stop cats from entering. Our unit is quite strong and can cover up to 5,000 sq/ft. They include an AC power supply which will allow you to power the unit via electricity. The advantage of this is that cats will stay away for good when the unit is running all the time. But if you don’t have power far enough in the yard, they can be powered by 4 “C” cell batteries using a motion sensor. When set this way, the motion sensor will turn the unit one when cats pass within 30 feet of the device. By default, our machine will send out ultra sound which will not hurt cats or other animals. But it is irritating to them and they will naturally avoid where they hear it. Our machine also has a strong LED light bar which will flash adding more to the effect. Lastly, when using the motion detector, plan on keeping the audible sound up too. This can be heard by people but again, its not harmful but since its definitely scares cats, use it where possible. One of the best features of our machine is the wireless key remote. This allows you to turn it on from afar as well as turn it off if you want to go outside where the machines are installed. This is handy when you need to walk your pet or work in the garden and don’t want to hear the machine. One machine can cover up to 5,000 sq/ft but if you’re relying on the motion detector, be sure to have enough machines in place to blanket all routes of entry. You can repel cats from the yard by keeping the unit always on using the included AC power supply or by powering it with batteries set to motion sensor. When using the included AC power supply, set the Operating Time to “24 HR” and Ultrasonic to “constant”. The Motion Sensor Sensitivity is “N/A” since it will be always on and the Sonic Volume should be turned all the down (to the left). Set the Frequency (yellow knob) to the middle. When relying on the motion sensor powered by batteries, set the Operating Time to “24 HR” and the Ultrasonic to “motion sensor”. The Motion Sensor Sensitivity should be on “30” and the Sonic Volume at “0”. The frequency (yellow knob) should be right in the middle. Just remember the range of the motion sensor is 30 feet so plan on having enough units in place to properly protect the yard. For easy installation, MOUNTING BLOCKS are handy. They can hold 1 or 2 repellers (back to back) and have a 1/2″ hole on their bottom so they will easily fit over a 1/2″ piece of rebar or any other wood or plastic stake. Ultra Sound Repellers will work fine by themselves as long as you have a good place to set them up. But we highly recommend getting the Units with Mounting Blocks in the kits we offer. Mounting Blocks allow you to place units anywhere and they will save time too. 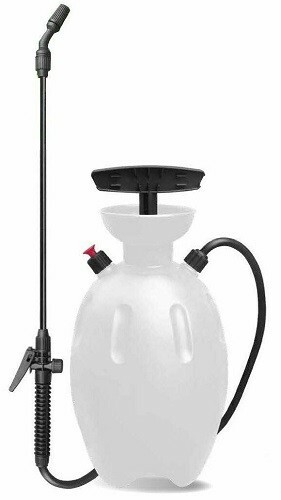 If you don’t want to use Ultra Sound, you can use our MOTION ACTIVATED WATER SPRAYER. This device works by using a Motion Sensor as well but instead of sound, it sprays water. It connects to any standard garden hose, runs on a 9 volt battery and has an effective field of view over 45 degrees wide. 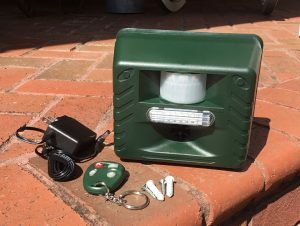 Simply set it out in the yard pointing to all entry points, adjust the sensitivity setting to the desired range and you will be able to keep any cat away. The Sensor will “see” any movement inside the zone you set and when it does it will release a 3 second blast of water at sprinkler speed and power. This blast is enough to keep any cat away your car, bird feeder, the side of your home, etc. The device will then reset itself and within 10 seconds is ready to blast away again. 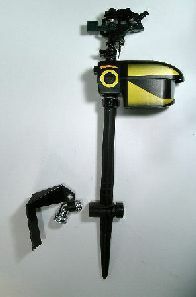 It has an adjustable field of view, a foot pad for easy staking and a pass through hose connection so that you are able to hook several of them up in series. It will work 24 hours a day in either light or dark. When using around cars or autos it is best to position one about 10-15 feet off of any one corner. This position will get complete coverage for two sides of the vehicle. In most cases this is enough. However, if the local cats have access to your vehicle from all four sides you might consider getting two. Positioned at opposite corners you will have all four sides completely covered. In some cases, you may have to live trap out local populations to have a significant impact. This commonly happens since cats are quite good at surviving in the wild. And once they start breeding, feral cats can become a real problem around urban environments where food is plentiful and shelter not hard to find. Live trapping can be done by setting out large cages where the cats are active. The smallest trap that’s effective for cats is our LT111230RD. This trap is easy to use and works well. 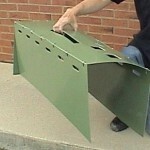 It features a removable rear sliding door making for easy trap sets and animal release. Use fish flavored cat food for bait but if you want something a little more dependable, go with our FISH PASTE. In most cases a LIVE TRAP COVER will help create a trap set more likely to have cats enter. These help keep cats comfortable and less spooky. When baiting for cats, set the trap with the front door locked open for a few nights. On the first night, place out some Fish paste at the entrance. A tablespoon is a good quantity. Once taken, set out another portion just inside the trap. Be sure to line the trap floor with pine straw or other material around the trap. This will help lower their concern about entering. After they take the bait twice, use a live set by unlocking the door and placing 2 tablespoons on a small paper plate along with some at the trap entrance. For faster results or if you have a particularly “shy” cat, use a LIVE TRAP COVER. These fit snug over the trap and will present a less threatening environment for them increasing the likelihood of them entering. We have 3 cars that are parked in a dark area. We leave for work in the dark and cannot see them. The cats want to climb up under the cars, even sit on the wheels. We have lost 2 cats from them getting in the fan belt of the truck. What can we use to keep the cats from climbing under the cars? We cannot leave the water hose hooked up so that is not an option. @Kathy Sankey: We have helped many people with this exact problem. Sometimes it’s other animals too but cats seem to love climbing up into engine compartments quite a bit. I am having a terrible problem with roaming cats spraying my home mostly at night. I believe it was one or two cats but now it appears to be many. I’ve used many, many products, sprays, sprinkles..etc.. Now it’s worse. My home is being sprayed about every other day!! I have talked to neighbors and will be talking at a neighborhood meeting real soon. I have one neighbor who “says” she concerned.. she has 12 cats, yes 12.. In which I think other cats are trying to get to hers… I’m just in the way. I also have a large dog that I have spent hundreds of dollars on keeping him in my yard and it has all worked. These cats spray my front door and all around… H E L P !? To get control, you’ll need to first eliminate the odor that’s attracting all the felines. The “spray” they’re leaving on your home is actually attracting more cats and this cycle will continue to spin out of control until you eliminate the scent. Add the scent of just one female in heat and there is no telling how many male cats will be coming around! The best product to remove and eliminate all their scent is the NNZ listed above. Mix it with water and spray down plants, the ground and the side of the building where the cats have been leaving their scent. Most homes will require several gallons sprayed out but the NNZ is very concentrated and will mix up many, many gallons. Next, install Yard Gards where you want to keep them away. You’ll want to set them up to run continuously and ideally, hooking them up to one main power supply will make the units easy to turn off and on. Most homes will require 1-2 per side of the home and initially, we suggest setting them out so you’ll be able to move them in order to find the best location. Once in place, power them all on sometime after dinner and let them run till the next morning. Cats don’t like this sound and if you first eliminate the odor around the home that’s been attracting them in the first place, the sound from the Yard Gard will keep them away for good. Once you find the best location for them to be placed, have them permanently installed and consider running a power line you can easily control for all the units installed. This way you can turn them on and off with one switch. Ultra sound won’t hurt them, you or your pet. But cats don’t like it and will avoid it altogether since they don’t live where the sound will be heard. Your dog will at first be inquisitive to the sound but eventually will barely notice it. And once they’re hooked up to a main power supply, you’ll be able to turn them off and on when he’s needing to go out. HELP. I live in a semi-rural area of Grass Valley, CA, though inside the city limits. My house is situated at the end of a dead-end street with a large lot right next door. The neighbors on the other side of my house have maybe 10 feral cats that they only feed and do nothing else to care for them. This horde of cats uses both my front and back yards as their toilet, and the entire area reeks. It’s extremely disgusting and 100 times worse in the hot summers here. I’ve tried all kinds of repellents but nothing covers the large areas that I need covered. In addition to peeing and defecating all over my yards, the cats hang out on my porch daily and nightly and just yesterday, I walked down the front steps to find at the bottom a big pool of cat vomit containing what was left of a bird wing. Here’s what I need: A strong repellent that will cover large areas of my yards, such as perhaps something that can be applied through a hose attachment or something. I need something that will work continually and not have to be re-applied constantly. And it must not cost too much as I have a very limited fixed income. Can you help? Recommendations? Any advice? Thank you! Unfortunately, there is no kind of granule or liquid repellent that can control the type of problem you’re describing. The types of products available today in either liquid or granule form will work for the occasional stray that might be wandering around your property. But when the cats are being fed close by and have been using any given area for defecating like you’re describing, liquid and granule repellents are not nearly strong enough to displace them. And if the condition you’re describing is in fact as bad as you say, there will be only two modes of action that will prove effective. The first will be to actively reduce the current population. This means live trapping the cats and then bringing them to your local animal control shelter. If in fact the number active around your home is currently 10 or more, it will soon be 20-30 and eventually even worse. Simply put, with no natural control mechanism in place, these ferrels will be reproducing prolifically. And that means it’s only a matter of time before their numbers get out of hand. So the first way to help reduce the problem will be to employ a live trap with fish paste bait. No doubt you should be able to get these cats onto your property with little effort since they are currently being fed by your neighbor. And once you have them coming around your property to be fed, capturing them and taking them elsewhere will prove to be the best method of control. The second method of control you can employ will be the use of Ultra Sound. These devices are highly effective on cats and can be configured to run continuously. If you situate 3-4 of these around your property and configure them to be “always on” using their included AC power adapters, you’ll be able to put in place a sound barrier which all cats will avoid. But don’t start using these until you reduce the number of cats in the area to 5 or less. Given the current level of cat activity, the first step to solving your problem will be to reduce the local numbers. Only then should the ultra sound be deployed.